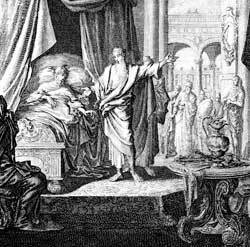 As Hezekiah lays sick, the prophet Isaiah tells him that he must get ready to die. AFTER THE PEOPLEof Israel were carried away into captivity by the king of Assyria, only the tribe of Judah remained of the twelve tribes that had entered the promised land under the leadership of Joshua. And Hezekiah was the king of Judah at that time. Now the kingdom of Judah was very weak when Hezekiah took the throne. For many years it had been ruled by men who were not serving the true God, and they had even shut up the temple of the Lord. Hezekiah began at once to restore the true religion. He called for the priests and the Levites to come to Jerusalem to cleanse the temple. Then when everything was ready for worship at the house of God, he sent invitations to the people in every part of the land of Judah and Israel, and commanded them to come to the Feast of the Passover, which they had not kept for many long years. Some of the people only laughed when they received Hezekiah’s invitation to attend the Feast. They had worshiped idols for so long a time that they did not care to return to Jerusalem again, to worship the true God. But many from the land of Judah came gladly, and there was a great meeting. Hezekiah destroyed the idols out of his land, and tried to teach his people to do right. He found in Jerusalem the brass serpent that Moses had made in the wilderness. He saw that the people were burning incense before this brass serpent, just as if it were an idol, so he cast it into the fire. He tore down the altars that had been built to worship heathen gods, and did much to strengthen his kingdom. The King of Assyria had gained power over Judah before Hezekiah took the throne. Every year the people of Judah had to pay Assyria a large sum of money. But Hezekiah was displeased to have his people oppressed by this heathen King. He decided to quit paying the money. He built up the walls of Jerusalem until they were very strong. Then he gathered an army and made ready to fight against the Assyrians. But Hezekiah’s army was only a handful compared to the hosts of Assyria. The enemies came into the land of Judah and took one city after another. Then they marched toward Jerusalem, and Hezekiah knew that his soldiers could not keep them away. He saw when too late that he had made a sad mistake when he refused to pay the money that the Assyrian King required of his people. So he sent word to the angry King, promising to resist him no more and to pay whatever that King should require. Hezekiah was afraid when he heard this message. He knew that his army was not strong enough to drive away such a powerful enemy. He took the letter that this King had written and went into the temple to pray. There he spread the letter before the altar and asked God to help him and his people out of their trouble. Then he sent some of his princes to visit the good prophet Isaiah and ask him to tell them about God’s will. That same night an angel of God visited the camp of the Assyrian King and caused a terrible sickness to fall upon the soldiers. By morning many of them lay dead. All of the leaders in the army were among the dead men, and the King rose up and hastened back to his own land. Never again did he return to fight against Hezekiah, for God had heard and answered the prayers of the good King. And years after this, while he was worshiping the temple of his god in Nineveh, two of his own sons killed him. Hezekiah did not feel that he could leave his people. He turned his face to the wall and prayed earnestly that God would make him well again. Then he wept bitter tears, and reminded God how faithfully he had tried to rule the people. And God heard Hezekiah’s prayer. The sun-dial was the instrument by which the King might know the time of day; for he had no clocks as we have now. And Hezekiah asked that the shadow might go backward, as it would not seem like a sign for the shadow to move forward. So Isaiah prayed, and the shadow moved backward ten degrees. And Hezekiah was healed of his disease, according to God’s word, and he lived for fifteen years more. During that time he built up his kingdom and became very rich. He grew proud of his riches; but God rebuked him, and he humbled his heart again. When he died all the land mourned for him, because they knew he had been the best king Judah had known.